In many cases, to-do lists help us keep track of what it is we need to get done. It also gives our brain a break from having to remember and keep track of it all. But I don’t think I’m alone in that I sometimes feel overwhelmed by my to-do list. Sometimes it feels like our to-do lists have a life of their own and grow uncontrollably. Sometimes it feels like we don’t get anything done because no matter how many tasks we’ve completed, the list is still far from being completed. To me, that is the essence of a failing to-do list system. The to-do list should help us be more productive and feel great about what we managed to get done. So, why don’t to-do list’s work, and how can we get around it? If you only have one list, then you only have one place to add all of your tasks which means the list will get really long really fast. If a task needs to get done on a specific date, add it to your calendar. For all other tasks you should consider having at least two to-do lists. One for ”today” or possibly ”this week”, and one as a running to-do list where you write all tasks as you come to think of them. Even if your daily to-do list only includes the tasks you want to get done today, things come up. Things we couldn’t foresee now requires our attention. In short; life happens and everything else will have to take a back burner. That’s why it’s important to prioritize. If we haven’t prioritized then maybe we’ve wasted the time we had today on tasks that really wasn’t all that important. Because we thought we’d get to the more important ones later on in the day. The key is to prioritize, then start working on the most important tasks as soon as you can. I know this might sound counterintuitive, but it is ok to delete tasks from your to-do list. There will be tasks that stay on your list for ages and you never get around to doing them. And you never get to them because they’re not really important. Every now and again, go through your list and remove tasks that you just never get around to doing (and that aren’t high priority). If it makes it easier you could always add those tasks to a ”to be deleted” list so that you don’t delete them straight away. That way you simply move them to a list that you never look at, and in a few months time it’ll be a bit easier to actually delete them. It might sound strange, but it works. There are a few drawbacks with having B.I.G. tasks on your to-do list. First of all, the task will feel daunting to start working on because, well, it’s so big. Secondly, you won’t get the satisfaction of checking it off as completed if you only manage to complete part of the task. However, if you break it down to bite-sized tasks it’ll feel easier to get going. Plus you get the bonus of being able to start checking things off as done because the tasks are smaller. As you probably know, a new free printable is added to the Good Life library every month. 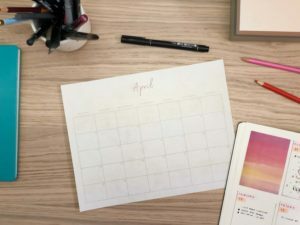 The theme for 2019 is monthly overviews. And although I know we all love our planners and bullet journals, sometimes it’s useful to be able to plan on a piece of paper. To be able to put that plan somewhere you’ll see it every morning, or whenever you sit down to do your work, depending on what you use overview to plan. I use mine to plan out the work on ForeverGoodLife, so I have my planner at my desk. If you don’t have access to the Good Life library, you simply sign up here to get immediate access to this + all previously created freebies. Wishing you a productive and joyful couple of weeks.